You are here: Home » MEDIA » Books » Dark Run (book 1) by Mike Brooks (book review). Dark Run (book 1) by Mike Brooks (book review). 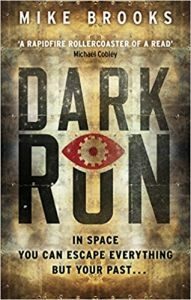 ‘Dark Run’ is the debut novel by Mike Brooks with a book full of dodgy space bars, roguishly heroic smuggler captains and assorted crewmembers with dubious pasts, mechanically augmented humans and seedy underground dwellings. You may be thinking that this all sounds like the ingredients for a standard and possibly clichéd rip-roaring, gritty space opera. In some ways, yes, this has a lot of familiar ingredients, but that’s not a bad thing. If it’s wild adventure and a spot of humour you’re after, then this is a really nicely done tale. The front cover boasts an endorsement from Michael Cobley and it’s his recent novel ‘Ancestral Machines’ that came most strongly to mind while reading this or maybe the ‘Guardians Of The Galaxy’. Ichabod Drift is the captain of the spaceship Keiko and, along with his crew, he makes a living mostly on almost the right side of the law, transporting goods, bounty-hunting and trading. He is talked into carrying out an illicit ‘Dark Run’ by a figure from his shady past, a mission that takes them through an unregulated trading outpost, the heart of Europe and several other interesting locations too. The familiarity of this kind of story and setting allows you to feel at home immediately but Mike Brooks doesn’t write lazily and try to get away with just window dressing. There are some nice touches included, like the electric tattoos that allow gang members and the like to keep their affiliation hidden along with some original names for some common SF tropes and space-faring jargon. Another aspect that I thought particularly well done was the culture shock for those born in space and experiencing weather for the first time and the way the contrast was drawn between out-of-the-way colonies and the bustle of Earth. The backgrounds to the various crewmembers gradually comes out during the course of the book, adding depth to the characters and layers of explanation to what at first might have seemed like a cast of stock characters. This ties in with the legend emblazoned across the stylish cover: In space, you can escape everything but your past. Not all is explained, though, and there are still some mysteries of the crew’s backgrounds left unexplored by the end, presumably histories that will prove relevant in future volumes. The escapades roll on from one to the next, always keeping the crew on their toes and making great use of the political backdrop that Mike Brooks has developed for his setting. A second volume, ‘Dark Sky’ was released not long after this novel, with a third, ‘Dark Deeds’ due later this year. I certainly found this book entertaining and rewarding enough that I’ll be looking out for the sequels. « A Conjuring Of Light (Shades Of Magic Book 3) by V.E. Schwab (book review).